If you don't trust companies such as Google, Microsoft or Facebook when it comes to communication, for instance because of the recording of your chat conversations on said networks and possibility that those records are made available to third parties or used for user profiling, you may prefer a secure solution instead. Note: Cryptocat was discontinued in 2016. You may use a desktop program for Windows, Mac or Linux instead, or switch to Cryptodog for Chrome which is a fork of the original extension. 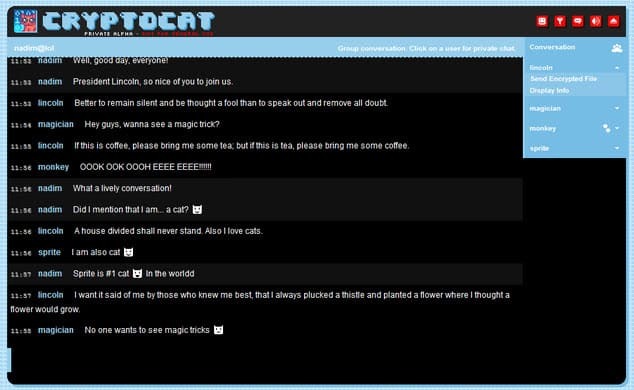 Cryptocat, available as a browser extension for Firefox, Google Chrome and Safari, may be that alternative. Probably the biggest difference to existing secure communication services is the ease of use with which you can get started. Instead of having to generate and exchange keys before you can even get started, you simply select the name of a chat room and a user name to connect. The service creates an encryption key for you during set up. The chat room looks like all other chat rooms you may have come across. You see users who joined it on the right, and the actual messages on the left. Options are available to either chat privately with a select user, or publicly to the whole group of users. It feels a bit strange that there is no option to password protect a chat room, considering that anyone guessing the name could enter it. While you'd then see the new user in the user list, it may happen that you overlook that at first, or have troubles locating the user if there are lots of users in that chat room. It also needs to be noted that while chat is encrypted, your IP address is not. The developers suggest TOR to overcome this issue. Any non leaking VPN or proxy connection should suffice though. Cryptocat now uses the standard XMPP-MUC protocol for multi-user Instant messaging transport. I suggest you read the full protocol specification here [pdf] if you are interested about the technical implementation. Cryptocat is an easy to use solution which that requires no initial setup, like account creation or public key exchange, to function. The developers note that it is still an experimental service and that it should be used with that in mind. Cryptocat, available as a browser extension for Firefox, Google Chrome and Safari, adds secure communication options to the web browser. You might want to mention that if you don’t use the chrome extension (or whatever future extensions they offer for other platforms), it might not be very secure. – http://www.schneier.com/blog/archives/2012/08/cryptocat.html for more details. https://blog.crypto.cat/2012/08/moving-to-a-browser-app-model/ This is their attempt to overcome this large security flaw. Please don’t trust host-based encryption systems with your mission critical information. The new (current) version of Cryptocat is *only* offered as an addon for Chrome, Firefox and Safari. The non-addon versions have all been shut down. This move has been exactly to address this criticism. Therefore, this discussion no longer applies. Note that if any single member of the chat fails to use the chrome browser extension, it’s as though no one is, effectively. Crypto.cat v2 should amend this, but as a result, it requires an addon always for all users. The new (current) version of Cryptocat is *only* offered as an addon for Chrome, Firefox and Safari. The non-addon versions have all been shut down. Sorry, Nadim. It wasn’t obvious that this article was an indirect announcement of v2. I admire your work. Much of what I said doesn’t apply to what your article recommends. Your links point to Crypto.cat v2, and it looks like v1 was pulled. It might be relevant to the story to point out that this is v2 and why it requires addons to use now. For those who want to give this a try, when I uninstalled the addon it also rearranged / removed most of my toolbar customization settings. Do a backup first or prepare to rearrange!